Ecumenical Youth Council in Europe → EYCE News → Events and Trainings → Young people gathering to promote solidarity! In January 2014 thirty young people from all over Europe and beyond gathered to spend a very special week together!EYCE training course “Looking for a Brighter Future! 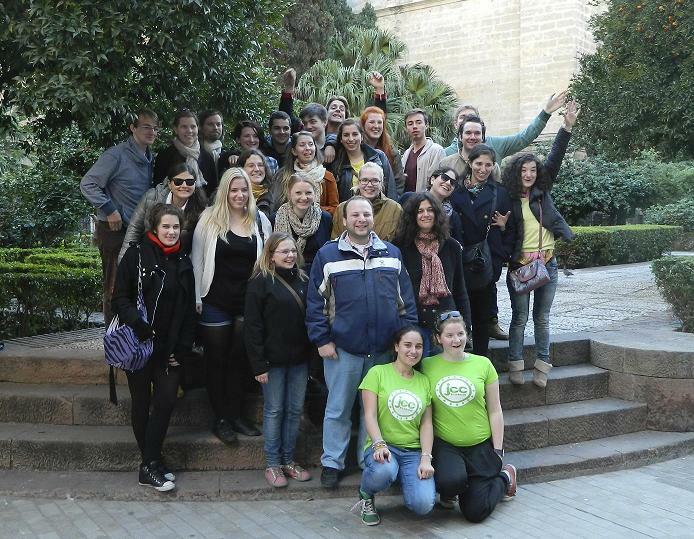 A training course for young people on solidarity in Europe” was held in Malaga, Spain, from the 20th to the 26th of January 2014. Youth from 15 countries gathered in order to learn, discuss and share about solidarity. The main aim of the course was to strengthen solidarity among people of all ages, to promote equal rights of different age groups, as well as to enhance active participation of young people. In the beginning of the training course, solidarity was dealt with from theoretical, philosophical and biblical perspectives, but along the week, the approach came more and more concrete and practical. Participants were supported in their learning process by three guest speakers, each one an expert in their own field. Theology professor Juris Cālītis taught about solidarity on abstract but mind-opening level. Economist Jürgen Born lectured on development of socio-economic crisis and the most vulnerable social groups affected by it. Åsa Gunven from European Youth Forum shared her perspective about advocacy and networking. She motivated participants with catchy examples of her personal experience, and she challenged them to act. The overall programme and most of all, practical workshops, gave opportunities for participants to share and learn from each other, for example, about the project management, the best practices or working with youth groups. Participants had the opportunity to directly put in practice what they had learned. First by volunteering in a soup kitchen for homeless people in the ecumenical centre Lux Mundi in Fuengirola, where they spent half a day. 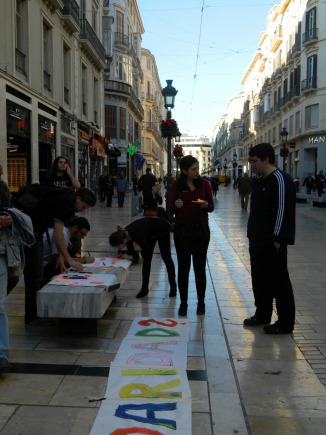 Then, by using their creative skills in organising street actions in Malaga city centre to promote solidarity. Street actions were fully planned and carried out by participants in small groups. In addition, participants could discuss and experience the specific context in Spain by meeting a local youth group from Malaga. The final part of the programme provided the participants with knowledge and ideas they could use in their home context. In the beginning of the week situations and challenges from the participants’ home countries were shared. At the end of the week the responses to those specific issues were sought and solutions were brainstormed. EYCE would like to take this opportunity and warmly thank guest speakers, our local partner and host Manfred Benzing, who welcomed us in the venue “Centro Ecuménico Los Rubios”, Gloria Uribe Cifuentes and volunteers from Lux Mundi in Fuengirola, and Jorge San Martín, Youth delegated diocesan officer, for their great support! 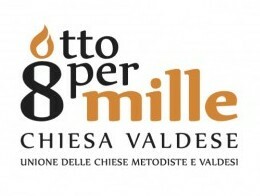 The training course was supported by the Council of Europe and Otto per Mille. ← To “use better the things we have”!